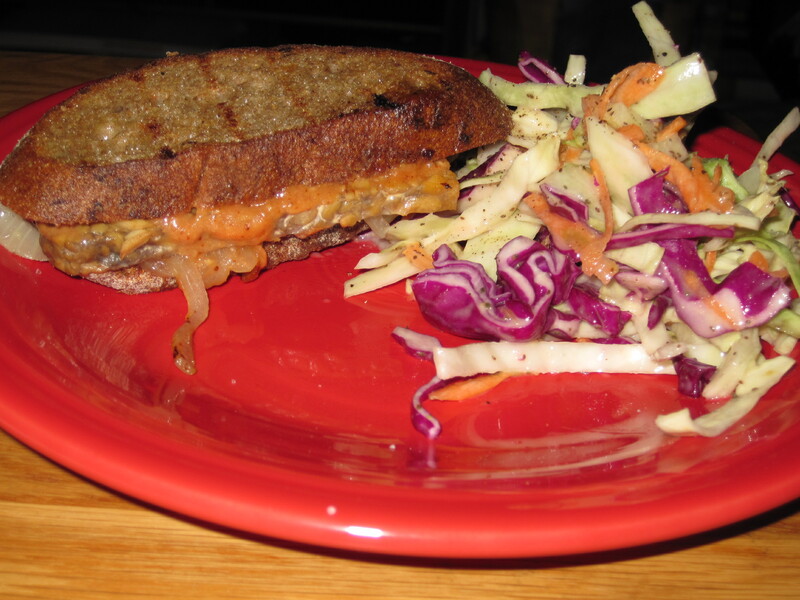 Tempeh Reuben with Rainbow Slaw | Cook. Vegan. Lover. Tonight I made the tempeh reuben from The Candle Cafe cookbook; I also made the vegan mayo to make the Russian dressing for the reuben. I also made some rainbow slaw with the vegan mayo, white vinegar, palm sugar, salt, pepper, celery seed and mustard powder. I plan to serve these at my interview tomorrow. This looks delicious! I do love a good reuben, but i have never tried this version. The kind I usually get from work is made from TVP and seitan. Whoah, that looks awesome!! Good luck at the interview…with food like this, how can you not nail it? Ruebens are always big winners! Great call! Yum, I’ve never had a reuben but it looks good and I love coleslaw!